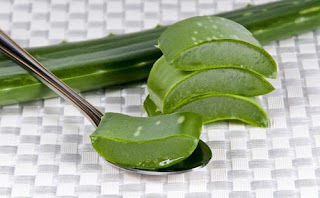 Aloe vera is also called aloevera. You must be familiar with this one plant. Green plants are known to function nourish the hair and smooth skin is the type of vegetation that we often encounter on the home page. Cool the burned skin to sunlight, especially for those who often works outdoors. Skin problems caused by weather, such as dry skin, redness, peeling, and mild irritation or rash. Diminish the reddish color of the bruises on the body. Cope with the discomfort caused by a razor. Can be used as an anti-aging cream or to address wrinkles. Treat the rash due to exposure to the sap of plants. Relieve itching from insect bites. Use every day to diminish scars and strecth marks, streaks of white or red due to pregnancy. Care for minor injuries caused by a knife cut or scratched. Tarnish spots blackish spots on the skin. Can be useful as a substitute for hair conditioners and jelly. Can be used to reduce acne. Used to speed healing of canker sores. Can be used as a natural body lotion. To relieve muscle cramps or tightening. Used to reduce the complaints on the issue of gum. Reduce the dandruff on the head.